It seems like a long time ago, but all the way back in June of 2012 I was delighted to receive a request from Barry Harmsen to become a technical reviewer on a book that himself and Mike Garcia were writing about QlikView. I was quick to accept. At the time, there were a couple of eBooks on QlikView available but there was also an "official" book in the offing (that, to date, doesn't appear to have been realized) but Barry was quick to say that his and Mike's book would compete on depth and quality. To be honest, I feel that the review process was quite easy on me. This is because Barry was living up to his promise and the quality of what was coming out in draft was very good. I did make some suggestions as to changes or rearrangements, but very few - the red biro still has plenty of ink left. I didn't get to review every single chapter, but I could tell from what I was seeing that Barry was living up to his other promise and the depth of the book is also excellent. When my copy of the published book arrived just before Christmas, I was able to see the whole picture and confirm the depth. 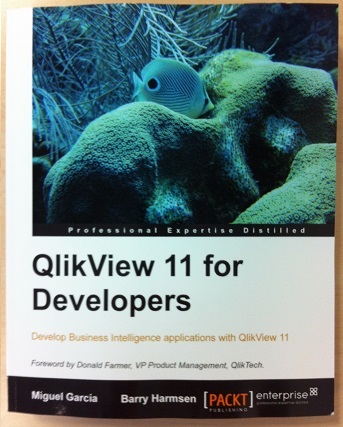 This book has everything that a new QlikView developer will need to get started. But not just that, it also has a lot of tips in there for the experienced developer (I know because I found some myself!) Even if you have a few years experience in developing QlikView, you will find nuggets of useful information in here. I love the way the book is structured for the beginner. Taking you from a great introduction of how QlikView works, through building some simple interfaces, diving into the QlikView script, advanced subjects like Set Analysis, and then all the way through to QlikView security - a non-trivial subject. No book can teach a new developer everything. You still need to cut your teeth on actual projects to hone your craft. But this book will get you a good way down the road to success. Stephen Redmond is CTO of CapricornVentis a QlikView Elite Partner. We are always looking for the right people to join our team. Many thanks for this great review. Very glad to read that your expectations were met. For those who are interested in purchasing the book, it is available from various online resellers. For example via Amazon, Barnes & Noble and Packt.